Downtown is the most walkable neighborhood in Harrisburg with 1,715 residents. Downtown has good public transportation and is somewhat bikeable. Nearby neighborhoods: Capital District, Hardscrabble, Capital Heights, South Alison Hill, Old Uptown Historic District, East Harrisburg and South Harrisburg. Daily errands do not require a car in Downtown Harrisburg. Downtown is the most walkable neighborhood in Harrisburg with a Walk Score of 92. Find apartments in Harrisburg's most walkable neighborhoods: Downtown, Capital District and Hardscrabble. 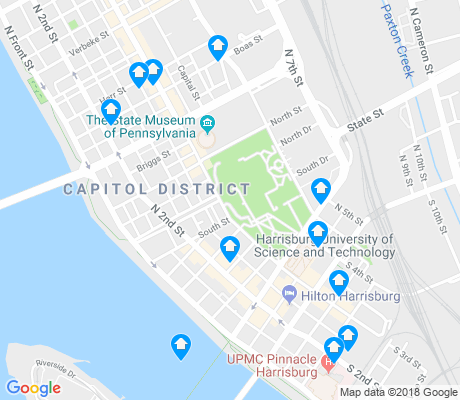 Compare Downtown to other Harrisburg neighborhoods. There are about 125 restaurants, bars and coffee shops in Downtown. People in Downtown can walk to an average of 21 restaurants, bars and coffee shops in 5 minutes.